Do you want to try out a beef jerky recipe, dry your herbs or make fruit rolls? 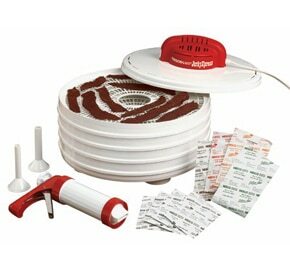 All this and much more is now possible with an affordable food dehydrator. You can snack healthy instead of snacking on fatty potato chips. The Waring Pro DHR30 is a middle of the road kind of unit. It doesn’t break the bank but offers a lot for the money you invest in it. There’s more control over temperature than with cheaper models, and it comes with a fruit roll tray as a bonus. To read more, you can start with some product details first. 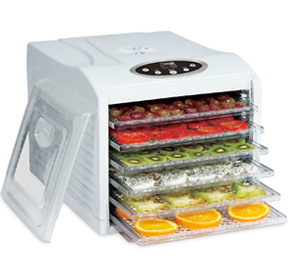 For more control over the drying process, this food dehydrator comes with an adjustable thermostat. There are five positions on the dial to choose from, including “Off.” These settings are “Fan Only,” “Low,” “Medium,” and “High.” Each of these corresponds to a particular temperature, with “Fan Only” being a good way to draw out extra moisture. The low setting is 110°F, the medium around 140°F, and high about 175°F, according to the manual. As a vertical flow model, this food dryer comes with plates that sit one on top of the other. They are made from clear, food-safe plastic which makes it easier to keep track of drying. For more versatility, there’s a solid sheet that comes with this unit. It is ideal for making fruit rolls and leather out of purees, jams, etc. If you want to expand, the Waring Pro can accommodate up to nine trays. Airflow is one of the most important aspects of every dehydrator unit. 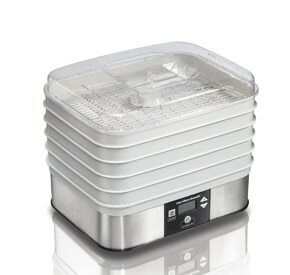 To help moisture evaporate during the drying process, this model has a lid with a mesh center that lets humidity escape. Moreover, there’s a fan located in the base, which pushes out hot air and spreads it out evenly. After you’ve dehydrated vegetables, herbs or fruits, you can pop your trays into the dishwasher for cleaning. With machine washing, you don’t have to spend precious time scrubbing each mesh. If you have stubborn stains, soaking in hot water beforehand does the trick. Thanks to adjustable temperatures, this food dryer can handle more or less, any produce. The low setting is good for herbs and flowers, medium for veggies and fruits, and high for fish and jerky. What’s more, there’s a setting where only the fan is working. This is helpful when you notice condensation accumulating on the inside of the lid and want to draw it out. It’s not just a marketing ploy; circulation is better than with most affordable models of this type. The fan installed on the bottom pushes hot air up and takes moisture from food with it. All you have to do is lay out your food, stack the trays and switch to the right temperature setting. Rotation is necessary once for cycles of up to 5-6 hours and twice for longer ones. Moreover, some herbs and vegetables don’t need to be rotated at all. When you want to check on how everything is coming along, you can take a look through the clear plastic instead of taking everything apart. Since this model has high-quality trays, we were able to put them into the dishwasher and cut down on cleaning time. This lets us spend more time trying out recipes and less time scrubbing stains. Those that need to dehydrate bulky food will be unable to change the height of trays with on this machine. But, this can be avoided by making thinner cuts or breaking up herb stalks, so it’s not a major inconvenience. The size of holes on each tray is not ideal for all purposes. If you’re drying herbs or smaller sized pieces of produce, you might have some issues with it falling through. If Waring included a finer mesh tray or sheet, this wouldn’t have been a problem. A cheap solution is to use parchment paper or buy a silicone mesh. Since you don’t need to check on this food dryer often, the manufacturer should have included a timer. But, because almost everybody has a smartphone nowadays, you can program an alarm or use a dedicated kitchen timer. Because there’s no timer, there’s no auto shut-off feature either. Once again, it would be a welcome addition, because drying can sometimes take more than 12 hours, and up to 24 or more. 1. 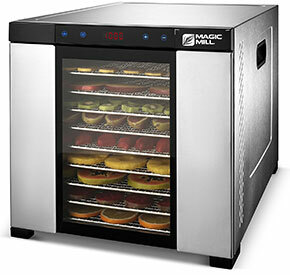 How much meat can you fit into this unit for beef jerky? You can fit at least three pounds of meat as indicated by users online. It’s best to start off slow and gradually increase the amount to be sure. 2. Can I expand the number of trays? How much? Yes. This model works with up to nine trays. If you are using more, you should check on your batches more often. 3. Can I use just one or two trays? Yes. There’s the minimum number of trays that you need to use is just one. 4. Are the plastic parts BPA free? Yes, everything is BPA free and safe to use with food. 5. Does this come with a recipe book? It doesn’t come with a separate one, but there are a few recipes included in the manual like beef jerky and teriyaki chicken. 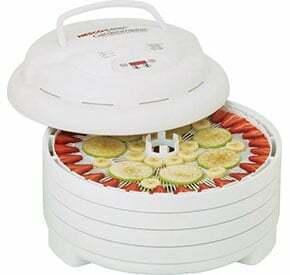 While testing this food dehydrator out, we had a lot of success with different produce. The Waring Pro DHR30 is good for jerky made from beef, chicken and other meats; it can process fruits and vegetables, and make leather rolls. It is versatile thanks to its adjustable thermostat. Moreover, good airflow means you don’t have to tinker with tray rotation as much. There are a few downsides as stated above, but for the price, they’re not a deal breaker, not by a long shot.